Footballers condemn plans to hold U21 European championship in Israel | It's Only Natural To Resist. A group of Premier League footballers and players in other major European leagues have condemned plans to hold the Under-21 European championship in Israel next year, saying it will be seen as a “reward” for this month’s assault on Gaza in which young people playing football were killed when a sports stadium was bombed. 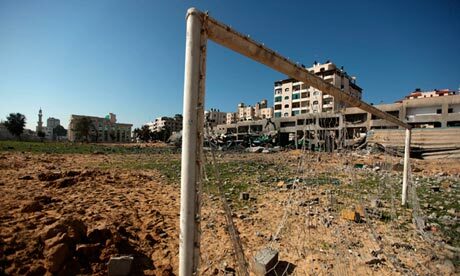 “We are informed that on 10 November 2012 the Israeli army bombed a sports stadium in Gaza, resulting in the death of four young people playing football, Mohamed Harara and Ahmed Harara, 16 and 17 years old; Matar Rahman and Ahmed al-Dirdissawi, 18 years old. We are also informed that since February 2012 two footballers with the club al-Amari, Omar Rowis, 23, and Mohammed Nemer, 22, have been detained in Israel without charge or trial,” the statement read. Uefa’s president, Michel Platini, has previously rejected pressure to move the competition out of Israel. “We cannot hold the Israel FA responsible for the political situation in the region or for legal procedures in place in its country. You know better than anyone that it is not by punishing people and isolating them that we achieve our aims. It is through dialogue that solutions are found,” he replied. This entry was posted on December 1, 2012 by ispeak4palestine. It was filed under Articles on Palestine and was tagged with Football, Gaza, Israel, Palestine, Politics, Soccer.